5. When a collision occurs in a network using CSMA/CD, how do hosts with data to transmit respond after the backoff period has expired? * The hosts return to a listen-before-transmit mode. 7. What does the IEEE 802.2 standard represent in Ethernet technologies? 8. Why do hosts on an Ethernet segment that experience a collision use a random delay before attempting to transmit a frame? A random delay is used to ensure a collision-free link. A random delay value for each device is assigned by the manufacturer. A standard delay value could not be agreed upon among networking device vendors. * A random delay helps prevent the stations from experiencing another collision during the transmission. Refer to the exhibit. Which option correctly identifies content that the frame data field may contain? 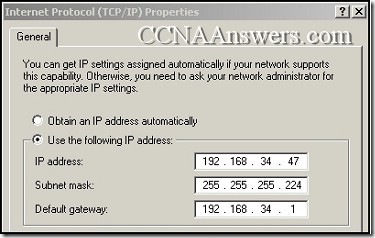 Host A will change the destination IP to the IP of the nearest router and forward the packet. Host A will broadcast an ARP request for the MAC of its default gateway. A result of 172.16.225.0 will be obtained. Host A will broadcast an ARP request for the MAC of the destination host. A result of 172.16.224.0 will be obtained. A result of 172.16.225.255 will be obtained. 11. 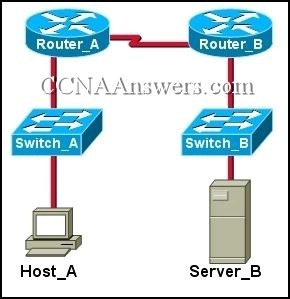 Which of the following is a drawback of the CSMA/CD access method? Collisions can decrease network performance. It is more complex than non-deterministic protocols. Deterministic media access protocols slow network performance. CSMA/CD LAN technologies are only available at slower speeds than other LAN technologies. 12. 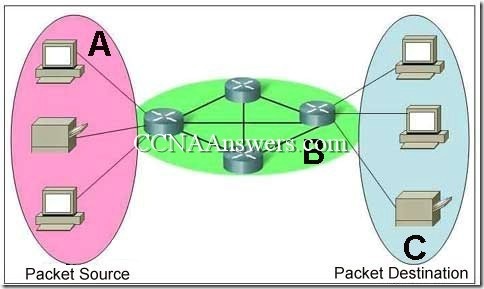 Ethernet operates at which layer of the TCP/IP network model? 13. What is the primary purpose of ARP? A packet with the destination IP of Router_B. A frame with the destination MAC address of Switch_A. 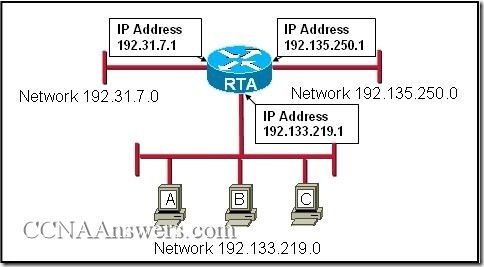 A packet with the destination IP of Router_A. A frame with the destination MAC address of Router_A. A packet with the destination IP of Server_B. A frame with the destination MAC address of Server_B. 19. Convert the binary number 10111010 into its hexadecimal equivalent. Select the correct answer from the list below. 20. 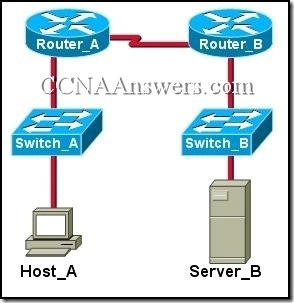 After an Ethernet collision, when the backoff algorithm is invoked, which device has priority to transmit data? Refer to the exhibit. What command was executed on a host computer to produce the results shown?